At last Tuesday’s County Council meeting, the council referred to committee proposals to develop a unified definition of “agriculture” and to prohibit alcohol use at Kamaole II Beach Park. Currently, “agriculture” is defined differently by various county agencies, depending on whether the context is land use planning, use of water or real property taxation. A resolution urging Mayor Alan Arakawa and his department heads to propose a single definition was sent to the Economic Development, Agriculture and Recreation Committee, chaired by Council Member Don Guzman, who introduced the resolution. Seven testifiers in the Council Chambers supported the resolution. Farmers shared personal stories about inconsistent and cumbersome regulations. A bill introduced by Council Member Don Couch to ban alcohol at Kamaole II in Kihei was also referred to Guzman’s committee. Currently, alcohol is prohibited at four county beaches: Charley Young, Honokawai, Kalama and Kamaole I. In addition, the council passed eight bills on second and final reading and adopted 11 resolutions. Resolution 14-26 authorized the mayor to apply for more than $1.6 million in federal funding under the Community Development Block Grant. The money would be provided for nonprofit organizations, including Maui Food Bank and the Maui Farm, and public-safety programs organized by the police and fire departments. Council members recognized flaws in the selection process. For instance, a funding request by the Lanai Community Health Center was rejected on technical grounds, without an appeal opportunity. With the application deadline looming, the resolution was adopted 5-1, with Council Member Riki Hokama in opposition and Guzman and I voting aye with reservations. We hope the CDBG process will be improved, including by giving the council more time for deliberations. Hokama, first vice president of the National Association of Counties, mentioned he’s been in touch with federal officials regarding the council’s concerns. By Resolution 14-32, the regular council meetings for May of this year were moved to May 6 and May 20. This will allow for fiscal year 2015 budget deliberations. 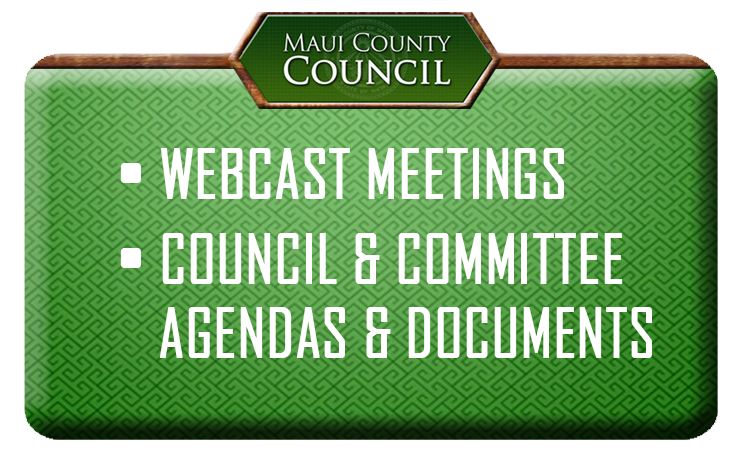 The council, by Resolution 14-33, extended its deadline to enact the Maui Island Plan implementation program to May 29. The bill to approve the program passed out of Couch’s Planning Committee, but more time is needed to schedule a public hearing and pass the legislation on two readings. Resolution 14-34, introduced by Council Member Mike White, calls on the county clerk to increase the number of early walk-in voting locations. In the 2012 elections, walk-in voting was available at two locations in the county, Wailuku and Kaunakakai. White explained that more opportunities for walk-in voting may improve turnout by making voting more convenient. Hokama, who holds the council seat for the Lanai residency area, commended the county clerk’s existing efforts to explore the feasibility of establishing walk-in voting on the island of Lanai. Bills 12 through 19, all relating to Fiscal Year 2014 budget amendments requested by Mayor Arakawa, were sent to him for his signature. The approved bills and resolutions are available for viewing in the Office of the County Clerk and on the county website at www.mauicounty.gov. * Mike Victorino holds the County Council seat for the Wailuku-Waihee-Waikapu residency area. As the council’s presiding officer pro tempore, he chaired the March 11 council meeting. “Chair’s 3 Minutes” is a weekly column to explain the latest news on county legislative matters.